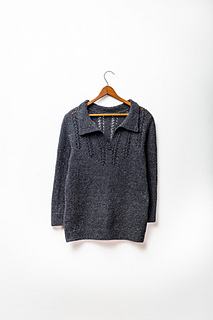 A weightless pullover with vintage styling and a simple lace yoke completes any outfit. Merle is knit in Loft, worked in the round up to the sleeve join, with deep hems and cuffs of garter stitch. The fronts, back, and sleeve caps are worked flat and sewn together. Inset panels of delicate eyelet columns on the back and fronts create a sweetly curved yoke, and the round neck is split with a pretty placket and finished with a pointed flat collar in garter stitch.